Thank you Des for this wonderful book. Should Be Part of School Curriculum! I want to BUY THIS BOOK for EVERYONE! “I LOVE it ~ It’s simple to follow, hugely insightful and heart-opening. It’s a guide that I believe ANY couple or single person, who sincerely want or value an intimate relationship, would hugely benefit from. Even if you think you have a good relationship already, there’s always those weaker areas that can let your relationship down and leave you feeling disappointed. When you understand what’s missing and then what’s needed to make the relationship strong, you have the potential to have something AMAZING with your partner, and in fact, in all your relationships. With humility, humour and passion Des Coroy delivers rich, experience based practices to equip you in creating an fertile foundation upon which your relationship can grow and bear the delicious fruits of your Love. “We have all been there and done that – 1. relationship fails 2. devour twenty self-help books 3. follow new resolutions 4. return to step one. What does this book offer, when we have tested and tried everything (at least we think so) and are still searching? The good news is that the author himself has gone through where we have all been and more – a number of relationship trials – which is also a bad news…or is it? If the majority of self-help books are written from the viewpoint of retired couples who somehow managed to get out of the rat race and are busy consulting others based on their active years, this book belongs to the tiny minority – a memoir/survival note scribbled by an active officer who not only shared his findings but also lives on his words. This book isn’t chicken soup for our soul. It is c-ration for surviving our future. I was expecting to receive a practical advice – or a trick – on how to make anybody fall for me in 15 minutes, and boy I am so happy that I was wrong. I was quickly taken to my own self, the dark side of my soul, and was forced to face it in full glory in a boot-camp with instruction manual. After all, every relationship is actually a reflection of our own soul, and there is no way we can survive the frontline without knowing ourselves first – strength and weakness, preferences and dislikes. 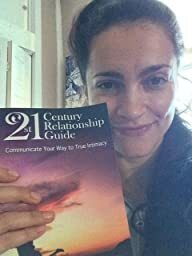 Some authors take joy in simply tossing the readers to the bottomless pit of despair but this is what keeps this book apart from other collection of advices – it offers an incredibly useful communication tool, the talking stick, to mend and strengthen our relationship with anybody we love. You won’t be left in the field with a void in your heart (after all, truth hurts). You will also be given a set of survival tools to forge a new path. It isn’t a long read, but it will take a lot of time to digest what’s in it. And what makes it “21st Century”? It does so by addressing our fragmented nature of being, constantly interrupted and divided by multitudes of tasks and obligations and distractions. It is becoming increasingly difficult to maintain our focus even for a few minutes, and this book beautifully captures this challenge and offers a way to bring us back into integration. I found this book really fun to read! This book is exactly what it says it is. Just brilliant!